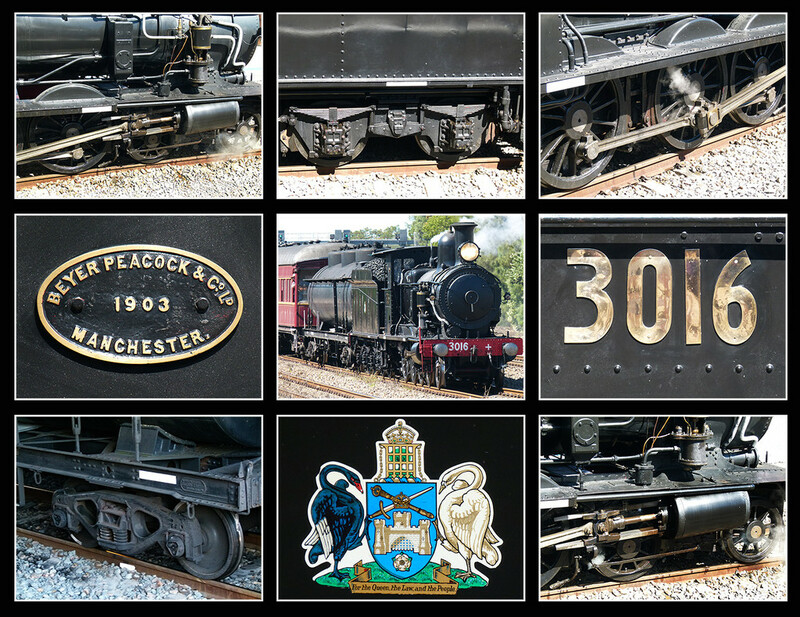 I thought I would make a collage of the last two steam trains at the Steamfest in Maitland last weekend and as you can see this is engine 3016. Tomorrow I will post a collage of the other locomotive at the festival. Locomotive 3016 was built in 1903 as a C30 Class 4-6-4 by Beyer, Peacock and Co in Manchester. 3016 was initially used for Sydney suburban services, however, following the electrification of Sydney's suburban network from 1926, Locomotive 3016 was converted for use on the NSW region lines. The rebuilt C30 class locomotives became part of the C30T Class with a new 4-6-0 configuration. 3016 is currently maintained and operated by Transport Heritage NSW under hire agreement. Tags train, steam engine, collage. Terrific collage Babs. Steam trains are amazing looking pieces of machinery. We love watching them meander through the Dales when were visit there. Great collage, so much information, love it. This is a great collage to capture all the variations of parts of the trains. Wonderful collage. I love trains. Beautiful old train nicely captured. AMAzing story and great collage!!! Wonderful collage... so many wonderful clear images. Lovely montage of this beautiful engine. Fabulous collage that tells the locomotive's story through tight looks at its separate elements. Very creative and terrific result. What a superb collage. So carefully created. Wonderful collage and very creatively put together. Great idea. Nice collage Babs, well put together. I presume the Manchester is an Australian Manchester? Great colllage Babs, love tomsee the old steam trains! this looks fantastic as a collage Babs! Terrific idea Babs, works very well as a collage, lots to see. I can hear it clanking in the traditional rhythm looking at these - they progress from top to bottom. Lovely! @cruiser @paul10 @susie1205 @365projectorgjenfurj @hermann @julzmaioro @merrelyn @littleconnie @pdulis @nicolecampbell @quietpurplehaze @mittens @m2016 @moonmtn @olenadole @seattlite @danette @craftymeg @kwind @claudiet @salza @gaylewood @taffy @busylady @jessikapanteleios @paulaw @radiogirl @annied @golftragic @bkbinthecity @casablanca Thanks so much, sorry for the late reply, we have had a few busy days. @happypat No Pat it is the UK Manchester. I think Beyer Peacock & Co Ltd. were in Gorton, Manchester. This is an excellent collage Bab - what a splendid locomotive machine. They always look best in black I think and I really like the way you have put this together.